Fine grained rock composed of lithified clay making the rock shale. In this close up image we can easily note the fine grained nature; no visible particles can be seen. 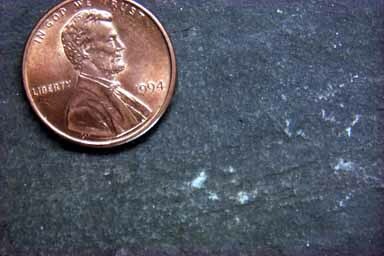 Furthermore, if you rub this rock across your finernail it will not scratch, typical shale behavior, but not siltstone behavior. The dark gray to black color of the rock can be easily seen here, but if you look at the next image the rock looks much lighter. It is just the way the light is reflecting.